To celebrate our 60th year, we are going to treat each other to a birthday bash! Something along the lines of our Friday night reunion party seems to be in order. A committee will be formed and all of us need to pass the word to each other! Stay tuned! 40th Reunion! What A Blast! So many smiles, so much laughter and the melting away - for a weekend - of 40 years! TO THOSE WHO DIDN'T ATTEND: I have been asked to let you know how much we missed you! Our reunions are great because of each and every 1978 graduate. Please keep in touch and know we toasted your health and happiness. 2. Complete the Reunion Evaluation Your opinion counts! 3. THANKS: To the Reunion Committee! To Jay Oakley who must be part bird dog - he can find anybody! To Jimmy, Bill and Robert for their wonderful words of welcome. To Laine for searching, finding and putting together all the 78 decor! To the decorations committee for making everything so special on Saturday night. To Marty for the cake! To Anne and Mary Lou for the flowers Friday! To Penny and Kathy for only breaking one glass each! To Kelly for shoveling up the glass - and the squirrel! To Kim Love for having all of us into her home Friday and making me the luckiest guy in the class! The food and atmosphere were awesome! To everyone for making the effort to reunite with the great WHS class of 1978! Come to see us anytime and mark your calendar for October of 2023! POST YOUR REUNION COMMENTS HERE! Casual dress evening with plenty of great food for h'oeuvres and a full buffet dinner. Open bar with beer, wine and distilled spirits. The weather was perfect so we ventured outside for great conversation around two outdoor fireplaces. Oh my did we have fun! Such a warm atmosphere for a long overdue blast with your dear friends! The food and drink were off the charts Kim! Thank you so much! At our 30th reunion this party lasted until three am! Can any of us really still stay up that late as we near the ripe age of 60? Ask Jim Maynard: he wins the Gold Medal Again! With two ballrooms we had plenty of space for dancing and conversation. ACC underwent a big renovation last year and the facility is really nice. We danced to the sounds of The Magnificents Band - they are awesome! We had great atmosphere at ACC with lots of 1978 WHS decor. We had an open beer and wine bar and assorted h'oeuvres. Dress code was cocktail attire, such as a sport coat for guys. Thanks to all classmates who made such a great effort to attend. We can still move on the dance floor! Contact all of Your Classmate Friends! 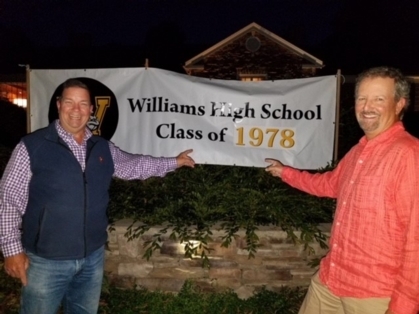 This permanent site for the WHS Class of '78 helps us keep in touch and prepare for our 45th reunion. Maintain your classmate profile and check your email for reunion updates. Also, whenever you make contact with your classmates, please be sure to point them to this website.